The busiest airport hotel in Maine, Embassy Suites by Hilton Portland, integrated Flyte Systems real-time airline flight information into its digital guest information signboard display. The hotel’s lobby display now gives guests continuously updated airline arrivals and departures for Portland International Jetport. Flyte Systems is the leading provider of cost effective airport travel information displays and digital signage content for the hospitality, corporate training centers, digital signage, convention center industries and related businesses. Click here to request information on Flyte Systems’ airport travel and guest information services. 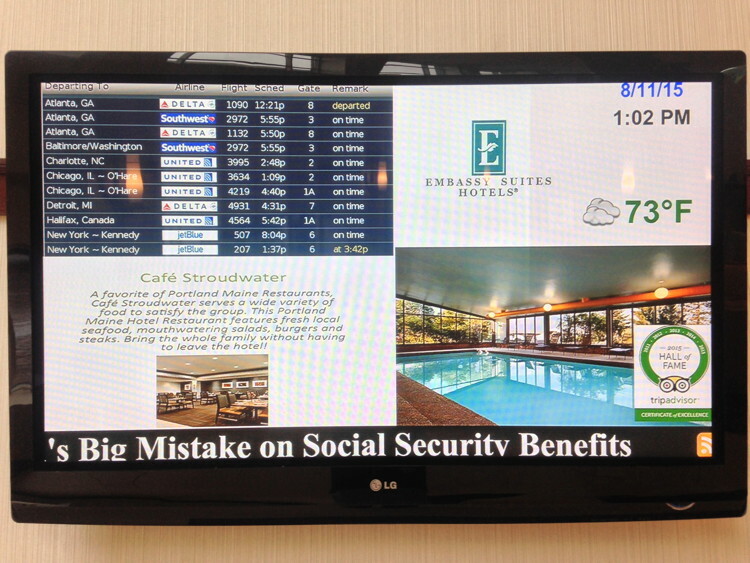 “Our ownership wanted to give guests accurate airline flight information when it acquired the Embassy Suites Portland. Integrating Flyte Systems real-time flight display into our lobby signage was easy and an instant success with guests,” said Jeanne Carpentier, regional director of sales & marketing for the property’s management company Emerald Hospitality. The property is directly adjacent to the Portland International Jetport and offers 24-hour shuttle service, ‘park and depart’ packages and a number of travel amenities.